I’ve been writing a literature review on Mary and the Reformation, and I handed in my first, rough draft on Monday, which we discussed today. It’s okay. It’s not brilliant, and it’s not right yet, but it’s okay. Although it needs re-jigging and more detail in places, it’s not in need of a complete re-write, which is good because it’s due in properly next Thursday. Some bits, where I’ve done more to engage with the sources and my responses to the work, are quite good. Basically, at the moment I need to draw out the significance of the things that interested me. All in all, I’m quite pleased. This is me, squealing quietly….. Yesterday I got an email from David, the chair of the Bolton Branch of the HA, to say that he had spoken to Michael Wood after a Merton Dinner on Friday and that he might be able to speak for the branch sometime in the next couple of years. Hence the squeals of excitement. On a more mundane level, I have spent the weekend re-reading John Edwards’s monograph on Mary I to try to work out why it irritated me so much. I’m about half way through for the second time and so far it hasn’t had the same effect, so I’m beginning to think that I must have been in a very irritable mood the first time. Also, I’m preparing for a seminar on Tuesday that I think it’s highly unlikely we’ll have. The one bonus is I’ve found a bit of evidence to back up a comment I’ve made in my review essay, that otherwise I’d have had to base on an article in Spanish that I haven’t read! So that’s quite pleasing. At last, a week where I feel like I’ve actually got something done. On Monday I knuckled down to actually putting some words down on paper, so I made a start on my review essay. 3000 words to review 20 books/articles isn’t many. When you consider that it has to have some flow, an introduction and a conclusion, it’s less than 150 words on each. And when at least three of the books are edited collections of essays, it presents quite a big problem. Still, I’m happy with my first draft. I need to give it a bit of sparkle. Oh, and having read the last two books on the list would help too. One of them I’m half way through, the other I’ve ordered on inter-library loans but it hasn’t arrived yet. My first draft (which of course won’t be MY first draft, is due in on Tuesday so that my supervisor can have a look at it before I finalise it and send it in for both my co-supervisors to read for our pre-Christmas meeting. Tuesday was good. I popped into the library for a couple of books, went across to the post-grad workroom and found myself a desk to work at. I took some tea and milk and made plenty of cups of tea. I got lots of work done and had my Spanish lesson at 5. Wednesday I spent in the pg workroom – I’d only gone in for Picnic Wednesday. It’s a particularly brilliant bit of Manchester history departmental life. I don’t know who had the idea in the first place, but I’d like to thank them now. The history postgrads, at all stages of their research, meet up in the glass box for lunch, to avoid the well known problems of isolation when pursuing individual work. On Thursday I worked from home and had an excellent singing lesson, and on Friday I did a rather daft powerpoint workshop. It was scheduled to last for 3 hours, we had all finished in 2, and had I been left to my own devices to get on with it I’d have been done in less than an hour! So I do feel like I’ve got a bit to show for all the work, finally. Yesterday I went to London on the train from Manchester Piccadilly, to go to the Branch Officers’ Meeting of the Historical Association. I got plenty of work done on the train, and even managed to send an email (which was a first for me – sending one from a train, that is!) before the WiFi cut out completely. I arrived back at Manchester just after 6pm. I got off the train and found myself walking down the platform alongside Michael Wood. Now if there was one historian that I would like to be like, it would be him (though possibly without the media career!). I haven’t got over it yet. In fact, I may never get over it. One very happy person! 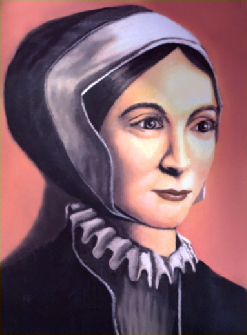 Catholic martyr Margaret Clitherow. Just seemed like a good picture! As of this afternoon I have a new theme for my work, which is now possibly going to be entitled “Perceptions of Female Piety 1553-1603”. So a change to the title of the page (although Philip and Mary live on in the permalink, I think), and no photo at the moment until I can find some kind of suitable image, but at least I have a new direction. It will take in some of the martyrs under Queen Mary, which I am happy about as it means that all my work over the last couple of years (and yes, it really has been that long) hasn’t been a complete waste of time. It will carry on through Elizabeth’s reign where the martyrs turn Catholic. The idea is to look at the way these women were represented. It can, if need be, take in a European angle, which would be nice but I’ll have to see how the Spanish class goes on. Tomorrow is my birthday, so I’m not likely to update the blog tomorrow. I wonder if I will still count as an early summer chicken? Quite possibly not. I’ve finally managed to get hold of the journal articles that I needed and two of the books that I ordered. I have another two weeks to do the rest of the reading of 20 items and form some kind of review article out of them. That’s going to be fun, but my supervisor seems to think I’m in about the right place. Whoop! Well, this week the children were back at school, which meant I had a bit more time, but my husband was still at home, which meant there was a bit of a distraction. But I’ve got quite a lot done, partly because it’s been reading week so I haven’t had Spanish or the MA course to go to. Also because I had a husband at home to make my brews! For the MA course I’ve skimmed through a couple of articles on the Atlantic world. Normally I would do this preparatory reading on Mondays, but next Monday I have a funeral to go to. I’ve also done a bit of Spanish homework, on my study routine and learning Spanish. I’ve read about George Marsh and the arrival of Protestantism in Lancashire. I read a really appalling biography of Margaret Clitherow too. Two or three times on every page I was told that a character ‘must have felt’ something or ‘must have done’ something or ‘must have thought’ something. The appearance of the two words ‘must have’ immediately put me off. If they are followed by ‘felt’ or ‘thought’ I am instantly irritated and have to overcome an almost overwhelming urge to throw the book out of the closest window. For my literature review, I’ve read a book of essays edited by Anna Whitelock and Alice Hunt, some of which were very interesting, others less so. I was surprised by how little in the way of primary source material some of them used. I’ve also read about 200 pages of Alexandra Walsham’s ‘Charitable Hatred’. After reading about 100 pages, I skipped to the end and read the conclusion. Then I went back to read the rest. It was much easier then, and I think this might be the way forward. After all, it’s not like reading a novel, where it spoils it if you know the ending; by reading the conclusion first you can then see if the book fulfils its stated aims and whether it really has made the case effectively for its conclusions. I’ve decided it’s good to know where you’re going. Apart from the studying, I’ve been on a pencil-sharpening course: ‘Improve Your Presentation Skills’. It was quite amusing, and some of the participants were clearly out of their comfort zone when asked to make strange phonic noises and breathe from their diaphragms. Happily, having done so much singing, such things are normal for me! But it was good to have things reinforced. And it all counts towards training hours. Oh, and at least there wasn’t a dead mouse under my desk. this morning my husband insisted that we went to Ikea and bought a new swivelly-office chair for me, as I’ve been using a cheap plastic one for the lat couple of years. Consequently, as I write this this evening I am much more comfortable. After school I went shopping in Bury. Having lived in jeans for the last 9 years, I had to get some clothes suitable for a funeral. I bought a pair of grey trousers from M&S on the grounds that they’d do for anything else that I had to do that required relatively smart clothes. Thinking ahead, there. Afterwards we all went to the Scout fireworks at church, where we watched a few fireworks go off and more of them not, while we got extremely wet. At the beginning of the week I sent my supervisors and head of postgraduate studies an email saying how unhappy I was last week. IT listed all the ideas that I had had or had been suggested over the last 2 years that I could develop into a PhD, along with reasons why I had discounted them. I got a nice, placatory message back from my supervisor, and went back to work with renewed enthusiasm. I still, however, have no idea what I’m going to spend the remainder of my three years working on, and although I am told that the prescribed reading will be useful whatever I decide to do, I can’t help feeling like I’m rather wasting my time. It’s not as if I can overrun on the three years. I don’t have the time or the money.